This was a very difficult book to listen to in audio, and I suspect it is equally difficult to read. The problem is that it is omniscient stream-of-thought and since it jumps around from character to character it is not always clear who is doing the thinking. You have to guess from context which person is thinking, and even after you’ve guessed that it’s not always clear (due to pronouns without antecedents) whether one character is thinking, or the other character is thinking about the first character. I had to read a description of the plot before I was able to get a clear version of the story, and after that my listening went much more smoothly, and I was able to understand what was going on. Another way of analyzing Mrs. Dalloway is more straightforward. Clarissa and Septimus are parallel characters who respond to their predicament with opposite actions. They are both very lonely and isolated people. Clarissa is lonely despite being surrounded by people. She recognizes the false sincerity of the friends she invites to her party. Her husband is unable to tell her he loves her. Her daughter is being “stolen away” by a religious fanatic. (That’s one thing I do know about modernism, they often reject religion.) During the course of the day, three former flames, all rejected by her, appear – seemingly out of nowhere. She spends a lot of time thinking about why she rejected them. In fact, she seems quite obsessed with the past and ignores the present. Septimus, on the other hand, feels isolated because he is suffering from a severe form of “shell shock” (now called PTSD) after losing a friend in the war. He, likewise focuses more on the past than on the present. Unlike Clarissa, who rejected people who could have been too consuming or controlling and thus ended up with insipid people in her life, Septimus is surrounded by control – mainly by his doctors who don’t understand what is wrong with him. Another difference is that Septimus commits suicide at the end. Although Clarissa has contemplated suicide, when she hears about the suicide of this young stranger, she realizes how much she loves life despite the loneliness. I imagine this contrast of parallel characters appears frequently in ancient classical literature, though I can’t think of specific examples since this, too, is a genre I am woefully under-read in. Very insightful commentary Rachel. I have not read this but I would like to. I find modernist books like this challenging. I am not sure if I would get that much out of something like this on audiobook. I find that such prose needs to be read with a lot of care and some rereading. I'll just do the best I can do. I agree with Brian in that listening to Mrs. Dalloway is not the best way to experience it. Stream of consciousness is too confusing and flowing as it is! Text breaks usually help to identify who's thinking. But one has to make do with what's available! 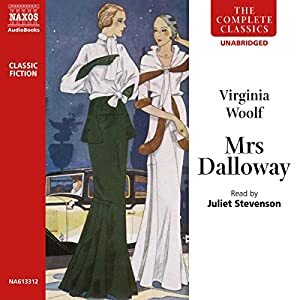 Time is one of the key components of Mrs. Dalloway – you say she's kind of obsessed with the past, but you also have the future (her daughter and the old woman in the window) and a very elusive present. There are lots of mentions of bells chiming, changes in light, and so on. Yeah, I gotta do what I gotta do. I noticed the time element to Mrs. Dalloway, though I didn't quite know what to think or say about it. Like you said in another comment, if I look too far into the symbolism I'll lose sight of the story. On the other hand, I do love figuring out what the author was trying to say…. I'm always nervous about picking up books written as a stream-of-consciousness, especially if the ignore rules of grammar. It's a style that I don't expect would work for me, but, like romance, it's something I haven't given enough of a chance. I'm glad you were able to find a plot summary to help you get through this one! Mrs Dalloway followed the rules of grammar. So did the Faulkner book that I read, luckily. I know that he and Joyce are well known for their use of poor grammar as a tool.